We describe the puff technique, by which pharmacological reagents can be administered during whole-cell patch-clamp recording, and highlight various aspects of the features that are crucial for its success. Feng, Y., Tang, B., Chen, M., Yang, L. Whole-cell Currents Induced by Puff Application of GABA in Brain Slices. J. Vis. Exp. (128), e56387, doi:10.3791/56387 (2017). Pharmacological administration is commonly used when conducting whole-cell patch-clamp recording in brain slices. One of the best methods of drug application during electrophysiological recording is the puff technique, which can be used to study the effect of pharmacological reagents on neuronal activities in brain slices. The greatest advantage of puff application is that the drug concentration around the recording site increases rapidly, thus preventing desensitization of membrane receptors. Successful use of puff application involves careful attention to the following elements: the concentration of the drug, the parameters of the puff micropipette, the distance between the tip of a puff micropipette and the neuron recorded, and the duration and pressure driving the puff (pounds per square inch, psi). This article describes a step-by-step procedure for recording whole-cell currents induced by puffing gamma-aminobutyric acid (GABA) onto a neuron of a prefrontal cortical slice. Notably, the same procedure can be applied with minor modifications to other brain areas such as the hippocampus and the striatum, and to different preparations, such as cell cultures. The patch-clamp technique, a primary tool for investigating electrical signals in neurons, was developed in the 1970s1,2. A major advantage of this technique is that it provides knowledge on how specific treatments (e.g., pharmacological) may alter neuronal functions or channels in real time3. Pharmacological evaluation of neuronal function during whole-cell recording in a brain slice requires the application of drugs, such as agonists or antagonists of specific receptors, to the neurons being recorded. This method allows the identification of neuronal alterations that occur following application of a specific drug, thus leading to a better understanding of the physiological and pathological properties of the neurons4. Although pharmacological administration can be conducted via either perfusion5 or puff6, the latter is the superior technique. In particular: (i) puff application rapidly increases drug concentration around the recorded neuron to a level such that desensitization of the membrane receptors is prevented; (ii) the volume of drug puffed is extremely low, so that there is little effect on the bath solution, which therefore reduces any undesirable effects of the administered chemicals on brain slices; (iii) the puff protocol can be set and saved, making the experiment very precisely reproducible; (iv) puff application represents economical use of agonists/antagonists, particularly where such reagents are expensive or difficult to obtain. Here, we will focus on recording whole-cell currents induced by puffing GABA in acutely prepared brain slices, a preparation that has the advantage of relatively well-preserved brain circuits. How we conduct puff-induced inhibitory currents7 will be described in this article. By using cesium (Cs+)-based internal solutions, and holding the neurons at 0 mV, we will introduce GABA-puff evoked inhibitory postsynaptic currents (eIPSCs) with appropriate technical details. Using a mouse model of depression induced by lipopolysaccharide (LPS) injection8, we show that the eIPSC amplitude evoked by a GABA puff is significantly reduced in slices of LPS-injected mice compared to vehicle controls. Our intention is that this article should show how the puff technique is widely applicable to studies aimed at evaluating the effect of any chemicals, compounds or drugs on neuronal activities in brain slices. Animal housing and all animal experiments were conducted in accordance with procedures approved by the Ethics Committee for animal research at South China Normal University, according to the Guidelines for Animal Care established by the National Institute of Health. Prepare 500 mL of standard artificial cerebrospinal fluid (ACSF) containing the components described in our published work7 as listed in Table 1. Use clean glass beakers with deionized water to prepare a fresh ACSF solution. Clean spatulas with deionized water and dry before using to add NaCl, KCl, NaH2PO4, NaHCO3, MgSO4, D-glucose, and add the CaCl2 after having bubbled the solution with 95% O2 / 5% CO2 mixture for ~20 min (as detailed in Table 1) to 500 mL of deionized water. Stir until fully dissolved. Ensure the ACSF is completely clear without any precipitation. Then adjust the pH to 7.2-7.4. Bubble with a gas mixture composed of 95% O2 and 5% CO2 for ~20 min. Prepare 250 mL of slice cutting solution containing the chemicals7 described in Table 2. Add KCl, MgCl2, NaH2PO4, NaHCO3, choline·Cl, D-glucose and add the CaCl2 last as indicated in 1.1.1, to 250 mL of deionized water and dissolve as described in 1.1.1 and 1.1.2. After bubbling with 95% O2/5% CO2, place the solution in a freezer for 15-20 min so that the cutting solution becomes ice-cold and partially frozen. NOTE: We use this cutting solution when making slices from 1-2 month-old mice; the formula may differ for mice older than 2 months. Prepare LPS solution by dissolving in sterile endotoxin-free isotonic saline (0.9% NaCl). LPS is administered intraperitoneally (0.5 mg/kg) and begin recording 2 h later. Take the cutting solution out of the freezer and homogenize to obtain a slush. Place the solution on ice and bubble constantly with 95% O2/5% CO2. Using large, sharp scissors, quickly decapitate a mouse as described9 and immediately put the head into a beaker filled with ice-cold (0-4°C) cutting solution. Cut the top of the skull along the midline in a caudal-to-nasal direction with fine scissors and remove the lateral skull portions. Remove the brain with a fine spatula and drop into ice-cold cutting solution. NOTE: Steps 2.2-2.3 must be done rapidly (ideally < 1 min). Place the brain on the lid of a 9 cm Petri dish filled with ice. Rinse the brain with ice-cold cutting solution. Cut off the cerebellum and olfactory bulb with a razor blade. Apply cyanoacrylate glue to the specimen holder of a vibratome. Carefully place the brain block on the drop of glue, rostral side up, and immediately immerse in ice-cold cutting solution. Adjust the blade holder of the vibratome to an angle of 15° with reference to the horizontal plane and prepare 350-µm coronal brain slices (blade vibration frequency = 85 Hz, speed = 0.1 mm/s). Using a pipette, transfer the slices into the recovery chamber filled with ACSF, incubate for 1 h (at RT) with constant bubbling of 95% O2/5% CO2. Make glass borosilicate micropipettes for use as recording electrodes or puff micropipettes according to the specific guidelines in the Puller Operation Manual. For recording electrodes, tip resistances are in the range 4-6 MΩ, while puff micropipettes have tip diameters in the range 2-5 µm. Add Na+ channel blocker (TTX, 1 µM), to block fast Na+ channel and thus action potentials, to ACSF and maintain a constant flow rate of this solution of 2-3 mL/min in the recording chamber, by peristaltic pump into the chamber and aspiration out of it. Bubble the ACSF with 95% O2/5% CO2 constantly to ensure the viability of the slices. Transfer a brain slice into the recording chamber using a modified Pasteur pipette whose fine tip was cut to fit the slice size. Cover the slice with a platinum slice anchor with parallel nylon threads spaced ≥2 mm apart to hold the slice on the platform. Fill the recording micropipette with internal solution7 (Table 3), and fill the puff micropipettes with GABA at 10 µM, 50 µM, and 100 µM (dissolved in ACSF), or ACSF as vehicle control. To prevent blockage with debris, apply light positive pressure using a 1 mL syringe before immersing the recording electrode in the ACSF. Using a micromanipulator under a microscope (4x objective lens), position the recording electrode and puff micropipette so that the tips appear in the center of the video image in the monitor (Figure 1A). Adjust the microscope focus (40x objective lens) while gradually lowering the puff micropipette and place it above the recording neuron at an angle of 45°. Keep the distance between the tip of the puff micropipette and the neuron recorded between 20-40 µm (Figure 1B). Slowly and carefully approach the neuron with the recording electrode and then release the positive pressure. Apply a weak and brief suction through the tubing connected to the electrode holder to create a giga-ohm seal. Maintain the voltage at 0 mV. After formation of the giga-ohm seal, compensate for fast and slow capacitance manually or automatically. Then apply a brief and strong suction through the tubing mentioned above to get into whole-cell mode. Record eIPSC in voltage-clamp mode. Apply low gas pressure (nitrogen, 4 - 6 psi) to the puff micropipette using a Picospritzer controlled by a Master 8 voltage step generator to deliver single or paired GABA puffs (Figure 2). Change the puff duration to obtain the best eIPSC results (Figure 3) and measure the eIPSC in the LPS-induced depression model ( Figure 4). The puff technique allows researchers to study the effect of drugs on particular receptors on the surface of a given neuron. In this article, we focus on currents mediated by GABA receptors. Figure 1 shows the puff and recording micropipettes. To eliminate any effect on recorded neurons of the physical pressure generated by the puff, ACSF and sucrose puffs (Figure 2A) are used as controls. The response induced by a GABA puff (black) can be blocked by a GABA-receptor inhibitor, such as picrotoxin as reported10, while the baseline condition can be recovered by ACSF wash-out (blue), as shown in Figure 2B. Notably, neither an ACSF nor a sucrose puff induces a response, suggesting that responses induced by GABA puffs are physiological and are mediated by GABA receptors located on the surface of the recorded cell. The dose and puff-duration response curves are shown in Figure 3. LPS has been shown to alter neuronal activities and animal behavior, but its effect on GABA receptor-mediated responses was not well known. When we compare currents induced by GABA puffs in brain slices of LPS-injected and vehicle control mice, we observe significantly reduced IPSC amplitudes due to LPS treatment (Figure 4). Figure 1. Diagram of the puff micropipette and recording electrode. (A) The distance between the puff and recording micropipettes. (B) The puff micropipette (left) and the recording electrode (right) on the surface of a brain slice. Please click here to view a larger version of this figure. Figure 2. Picrotoxin blockade of IPSC induced by GABA puff. (A) Puffing ACSF and sucrose (50 µM) induces no response. 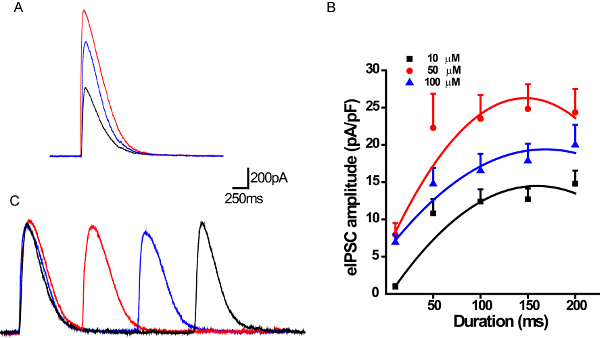 (B) Puffing 50 µM GABA induces an IPSC (black) (puff duration = 200 ms, 4-6 psi) in ACSF containing TTX (1 µM), CNQX (20 µM) and AP5 (50 µM) to block action potentials and excitatory current mediated by AMPA and NMDA receptors. The GABA-induced IPSC is blocked by bath application of a GABA receptor inhibitor, 100 µM picrotoxin (red). The IPSC recovers after wash-out of picrotoxin. Please click here to view a larger version of this figure. Figure 3. Dose and puff-duration response curves. (A) Sample IPSCs induced by 10, 50, and 100 µM GABA (puff duration = 50 ms, 4-6 psi). (B) Puff-duration response curves. Black, n = 11; red, n = 8; blue, n = 10; polynomial fit. Data are shown as the means of multiple experiments (8 ≤ n ≤11); error bars indicate SEM. (C) Repetitive currents evoked by GABA (50 µM) puffs at inter-puff intervals of 1, 2 or 3 s (puff duration = 100 ms, 4-6 psi). Please click here to view a larger version of this figure. Figure 4. eIPSC amplitude is reduced in LPS-injected mice compared to vehicle controls. 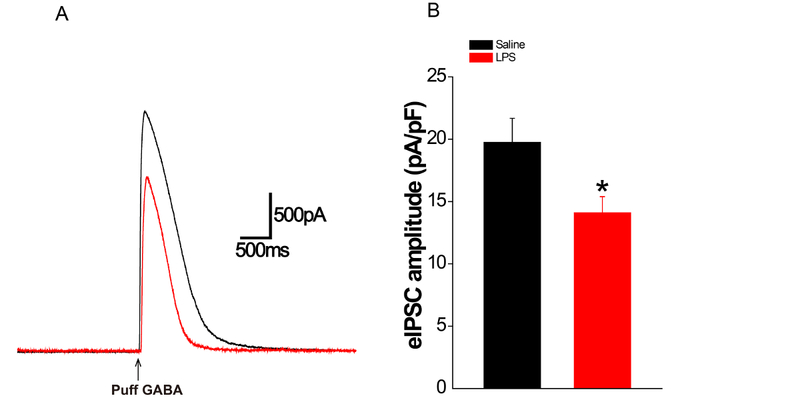 Puffing GABA induces a significantly reduced IPSC amplitude in LPS-injected vs. control neurons (saline, 19.74 ± 1.93 pA/pF; LPS, 14.10 ± 1.30 pA/pF; p = 0.02). Please click here to view a larger version of this figure. Table 2. Slice cutting solution. Table 3. Internal solution for whole-cell patch recordings. Puff application is widely used to evaluate postsynaptic receptor function3,4,7, but requires precise control in each experiment. We describe here a procedure involving whole-cell patch clamping, which demonstrates GABA-puff induced IPSCs (i.e., eIPSCs) in prefrontal cortical brain slices. The resistance of the recording electrode is about 5 MΩ, while the tip diameter of puff micropipettes is about 2-5 µm. Puff pressure is between 4-6 psi: this range is critical, as a higher pressure may cause neuronal damage, while a lower pressure can result in insufficient activation of the postsynaptic GABA receptors. The horizontal distance from the tip of the puff micropipette to the neuron recorded is about 20-40 µm (the diameter of 1-2 neurons), and the angle between the puff micropipette and slice surface is about 45°. The tip of the puff micropipette is vertically 20-40 µm above the slice (z-axis). The puff duration should be in the range 10-150 ms. 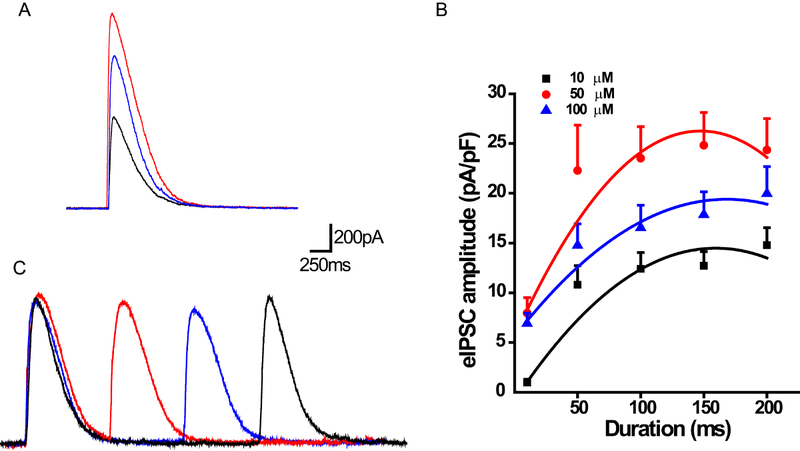 Under the above circumstances, puffs of 10-50 µM GABA induce an appropriate neuronal response and the eIPSC amplitude and kinetic parameters obtained are reproducible. 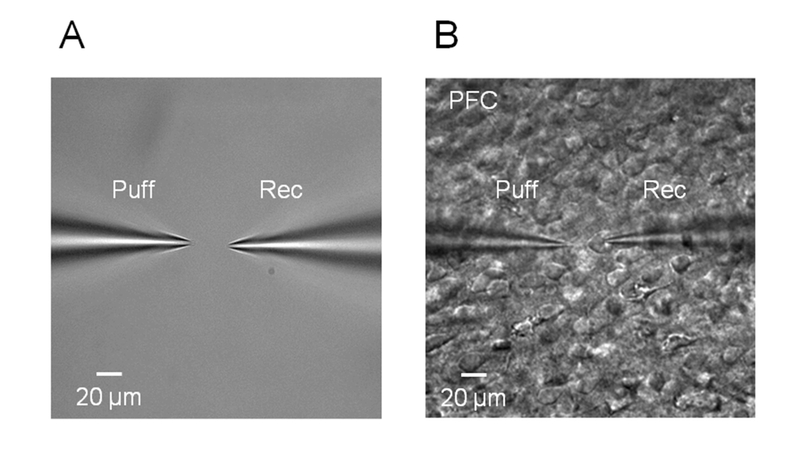 Although the protocol described here focuses on puff application to a slice patch, it is also suitable for recordings in neuronal cultures, as shown in our published work7. We also show here eIPSCs resulting from paired-puff application of GABA. Paired-pulse protocols have been widely used to evaluate presynaptic properties7,11, but possible postsynaptic effects, such as changes in neurotransmitter-receptor binding rate and binding affinity, which could influence paired-pulse ratios, cannot be determined by presynaptic paired-pulse stimulation. The protocol described in this article provides a way to elucidate postsynaptic alterations in response to paired and even pulse-train stimuli. The reduction in eIPSC amplitude in the prefrontal cortex of LPS-injected mice suggests that altered levels or activity of GABA receptors might underlie LPS-induced behavioral changes. Although, as with most drug delivery techniques, it is difficult to know the exact GABA concentration reaching the target cell, it is still possible to maintain the concentration of GABA at certain levels in the tissue by being consistent with the type of micropipettes used, and with parameters such as puff drive pressure and distance. In our case, the volume of solution puffed is about 1.1 µL at 100 ms duration. Thus, puffing allows quantitative studies to be performed7,12. The preparation of healthy brain slices from the acute prefrontal cortex is critical for the puff recording procedure we describe, and the following points should be borne in mind. First, dissect the brain and separate the prefrontal cortex quickly (< 1 min) and then keep the brain block in ice-cold cutting solution for no more than 1 min. Next, tightly glue the brain block on top of the specimen holder of vibratome, or otherwise the brain block may float during sectioning. The speed and frequency of the vibratome should be set to generate even, healthy slices. Effort must be made to conduct all above procedures at 0-4 °C to minimize neuronal excitability. It is worth noting that the cutting solution we describe in this article should be used for 1-2 month-old mice. For older mice (i.e. >3 months), the cutting solution should be replaced as described13. The puff technique is applicable to a range of patch-clamp experiments involving pharmacological treatments, and can also be used to test the effect of drugs on the electrical activity of any neurons. The authors would like to thank the following organizations: National Natural Science Foundation of China (31171018, 31171355), the Science and Technology Division of Guangdong (2013KJCX0054), the Natural Science Foundation of Guangdong Province (2014A030313418, 2014A030313440), and Guangzhou Science and Technology Bureau (201607010320). Neher, E., Sakmann, B. Single-channel currents recorded from membrane of denervated frog muscle fibres. Nature. 260, (5554), 799-802 (1976). Sakmann, B., Edwards, F., Konnerth, A., Takahashi, T. Patch clamp techniques used for studying synaptic transmission in slices of mammalian brain. Q J Exp Physiol. 74, (7), 1107-1118 (1989). Eyo, U. B., et al. Neuronal hyperactivity recruits microglial processes via neuronal NMDA receptors and microglial P2Y12 receptors after status epilepticus. J Neurosci. 34, (32), 10528-10540 (2014). Dickinson, G. D., Parker, I. Factors determining the recruitment of inositol trisphosphate receptor channels during calcium puffs. Biophys J. 105, (11), 2474-2484 (2013). Lee, J., et al. Columnar distribution of activity dependent gabaergic depolarization in sensorimotor cortical neurons. Mol Brain. 5, 33 (2012). Glykys, J., Mody, I. The main source of ambient GABA responsible for tonic inhibition in the mouse hippocampus. J Physiol. 582, (Pt 3) 1163-1178 (2007). Chen, M., et al. APP modulates KCC2 expression and function in hippocampal GABAergic inhibition. Elife. 6, (2017). Dunn, A. J., Swiergiel, A. H. Effects of interleukin-1 and endotoxin in the forced swim and tail suspension tests in mice. Pharmacol Biochem Behav. 81, (3), 688-693 (2005). Engel, D. Subcellular Patch-clamp Recordings from the Somatodendritic Domain of Nigral Dopamine Neurons. J Vis Exp. (117), (2016). Wondolowski, J., Frerking, M. Subunit-dependent postsynaptic expression of kainate receptors on hippocampal interneurons in area CA1. J Neurosci. 29, (2), 563-574 (2009). Yang, L., Wang, Z., Wang, B., Justice, N. J., Zheng, H. Amyloid precursor protein regulates Cav1.2 L-type calcium channel levels and function to influence GABAergic short-term plasticity. J Neurosci. 29, (50), 15660-15668 (2009). Huo, Q., et al. Prefrontal Cortical GABAergic Dysfunction Contributes to Aberrant UP-State Duration in APP Knockout Mice. Cereb Cortex. (2016). Zhou, W. L., Gao, X. B., Picciotto, M. R. Acetylcholine Acts through Nicotinic Receptors to Enhance the Firing Rate of a Subset of Hypocretin Neurons in the Mouse Hypothalamus through Distinct Presynaptic and Postsynaptic Mechanisms. eNeuro. 2, (1), (2015).